Thanks for stopping by for the latest edition of the Know Your Farmer series. This week we're proud to feature a staple at the Norcross Community Market - Phoenix Gardens. The farmers at Phoenix are Brennan and Gwendolyn Washington, and their son, ToJuan. Phoenix is located approximately 15 miles northeast of Norcross in the Lawrenceville area, which is largely suburban. Brennan and Gwendolyn have about 2.5 acres that they've been farming since 2005. 2.5 acres is really quite small by most farming standards, and this compact space is one feature that makes Phoenix Gardens unique. Brennan and Gwendolyn have worked hard to make the land really work for them. They have become quite the experts at producing good quality products from such a small space. Their farm includes 3 coop houses, plus a greenhouse, and they raise crops in high tunnels, raised beds and more traditional fields, while staying true to their pledge to be good environmental stewards. What Does Phoenix Gardens Produce? Brennan, Gwendolyn and ToJuan grow a diverse selection of vegetables, fruits (including lemons and limes! ), and herbs, and they produce year round. 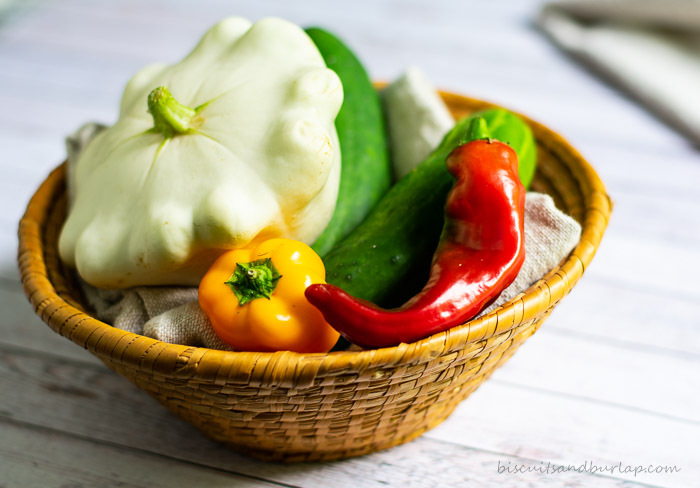 In the fall and winter they will move from traditional summer crops like peppers, squash and tomatoes to greens and other cold weather produce. Recently added to the selection from Phoenix is ginger, turmeric and aronia berries. A special favorite of folks at our market is their beautiful farm fresh eggs. What Certifications, Recognition, Achievements and Memberships are You Most Proud of? Brennan is the founder of the Georgia Farmers Market Association, of which Norcross Community Market is a proud member. 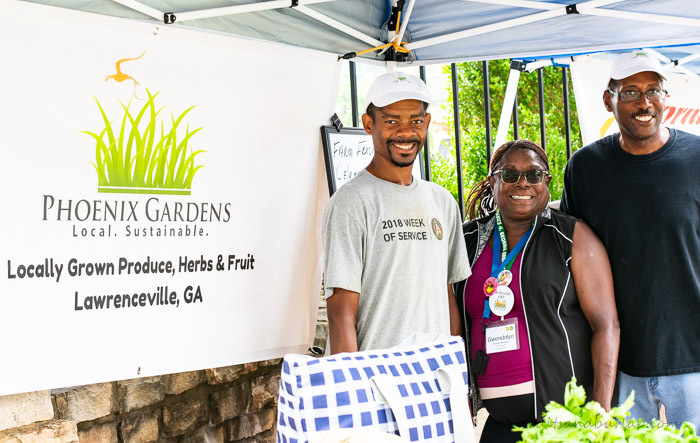 Phoenix Gardens is Certified Naturally Grown, and Brennan serves at the Southeast Outreach Coordinator for SARE (Sustainable Agriculture Research and Education). Read more about that granting organization by clicking here. Beginning this very week at Phoenix Gardens is a training program for other growers, including some small scale farmers. This program is made possible through a Foodwell Alliance grant. Just ask Brennan Washington this question, and he bubbles with enthusiasm. There is so much he and Gwendolyn have in the works. He personally is working to establish a meat processing plant in Georgia that would be led by a producer organization. They are working on adding a frost-tolerant grove of citrus, now in development at the University of Georgia. The answers to this question have been as unique and diverse as the farmers themselves. Brennan and Gwendolyn just plain feel at home in Norcross. They've been here since the old days of the Whistle Stop market and they have a soft spot in their hearts for our community. We feel the same about them and we hope to keep seeing them here for many years to come. Curious about the name "Phoenix" Gardens we were sure there was a story behind the name. We were wrong! There are two stories. First Story: In the early days of the farm it looked as though Gwinnett County would need the Washington's land for the Sugarloaf Parkway extension. At the last minute, a rerouting of the parkway was decided on and their farm was spared, thus the rising Phoenix. Second Story: In 2015 Phoenix Gardens suffered a devastating fire, and were out of production for 18 months. They've worked hard, and have come back better than ever, and now their farm is truly a Phoenix rising from the ashes. See you at the Norcross Community Market! Be sure to look for Brennan, Gwendolyn and ToJuan at the Phoenix Gardens booth, and let them know you read their story here. The next in the Know Your Farmer series will be coming soon. In the meantime, we would love to have you sign up to receive weekly Southern recipes from Biscuits and Burlap by clicking this link. Norcross Community Market has been selected to receive a grant from AgSouth Farmers Credit as a part of AgSouth’s Think Outside the Store® farmers grant program. The funds are designated to be used for promoting the market, and Norcross Community Market was chosen based on our plan to increase public awareness of the market with this “Know Your Farmer” series. To read more about this series, please visit the first edition here. Pam and Sara are local residents (Pam lives in Norcross and Sara in nearby Clarkston) and are a mother-daughter team of food bloggers at Biscuits and Burlap. They are huge believers in buying local to support your community and cooking with the freshest food possible. Visit their blog and try some of their Southern recipes!